Arim does not meet the criteria for any standard classification. It is an unclaimed Non-Aligned world located in the Goss Subsector of Bourne Sector. The primary is an unnamed orange subgiant star. It has a luminosity of 4.67 Sols, a mass of 2.3 Sols, and a diameter of 4.592 million km. The inner system consists of (I) a trace atmosphere worldlet, (III) a trace atmosphere inner world, and (IV) a standard atmosphere ocean-covered hospitable world – orbital position (II) is empty. (V) a corrosive atmosphere inferno world orbits within the habitable zone. (VI) a sparse icy planetoid belt, and (VII) a ringed large gas giant form the outer system. Many of the worlds retain satellites. The companion is an unnamed dim red subdwarf star that orbits the primary at a mean distance of 598 AU (orbital position (XIV), 89.4 billion km) and has an orbital period of 9,640 years. It has a luminosity of 0.00103 Sols, a mass of 0.081 Sols, and a diameter of 109,000 km. (I) an exotic atmosphere bigworld, (II) a dense icy planetoid belt, and (III) a small gas giant form the outer system. Both of the worlds retain satellites. The warm hospitable water world lying in orbital position (IV) around the primary has extensive, abundant native life, with complex organisms inhabiting every ecological niche. Their metabolic functions drive the process of atmospheric renewal. 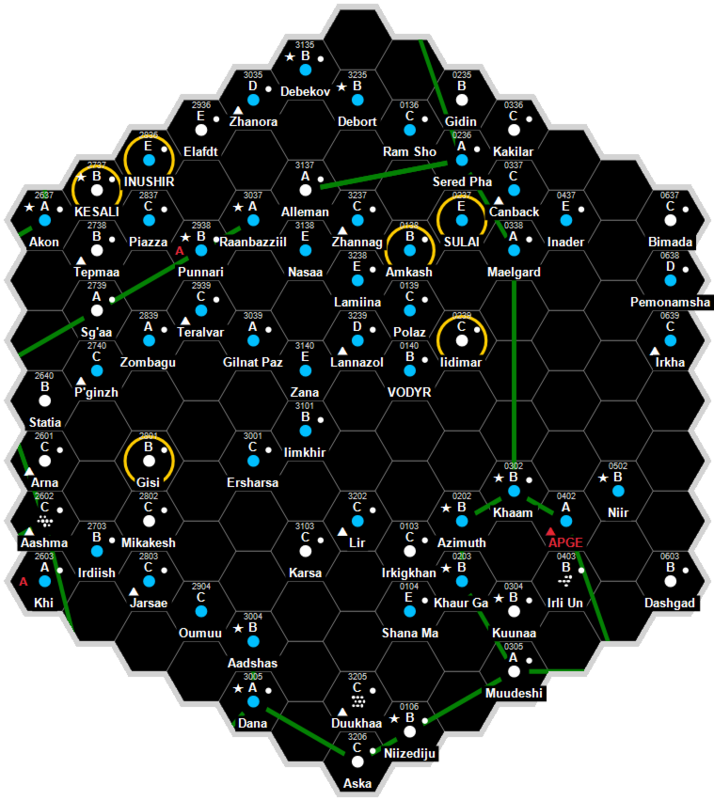 The Arim system has no listed Starport data. The Arim system has no listed Technology Level data. The Arim system has no listed Government data. The Arim system has no listed Population data. This page was last modified on 3 June 2018, at 15:56.